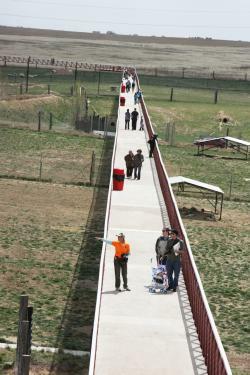 The Wild Animal Sanctuary has broken a world record for the longest footbridge. The sanctuary achieved the record by extending its existing walkway by a half mile, stretching it to more than 1.5 miles. It allows visitors to view rescued wild animals without disturbing them. Officials from Guinness World Records presented the non-profit organization with a certificate on Oct. 31, 2016, after taking the record from New York. The official honor will belong to the State of Colorado. In conjunction with the footbridge expansion, the sanctuary also unveiled its new 48,000-square-foot welcome center. After learning about captive wildlife, visitors can check out the ice cream shop, gift shop and restaurant. Located 30 miles from Denver, the 720-acre rescue and educational facility is home to more than 450 animals, including African lions, black bears, grizzly bears, mountain lions, leopards, wolves, servals, bobcats, foxes, lynxes, coyotes, raccoons, porcupine, ostriches, emus, camels, alpacas and horses. The organization has rescued exotic and endangered animals from around the world that have been abused, abandoned, exploited or illegally kept. The animals are provided lifelong homes and in turn become ambassadors that educate the public on the world’s captive wildlife crisis.